Gigabyte P2742G: Monster graphics to match its beastly proportions? Graphics. It's the final frontier for mobile computing. We'll come to the reasons why momentarily. But the bottom line is that it means going after a laptop with 3D grunt is going to cost you. And that makes the new Gigabyte P2742G actually look like something of a bargain for around £1,000. It's a big, brash 17-inch portable gaming rig with a full-HD screen, a quad-core CPU and - critically - a dedicated graphics chip. The problem for mobile gaming goes something like this. CPU performance is stagnating. In fact, Intel bases most of its desktop CPUs on mobile designs these days, so the performance gap is tolerable. Storage performance has gone stratospheric of late, too. And here again it's the 2.5-inch form factor traditionally associated with laptops that now dominates in the shape of solid state drives. So you can have desktop-rivalling hard drive performance in your lappy, too. Which really just leaves the graphics. What you need is a dedicated graphics chip and that's going to cost you in more ways than one. It makes a laptop more complex and costly. It uses more power, which does bad things to battery life and demands more cooling. That in turn means you need a bigger box to put everything in and portability takes a knock on the head. Yup, you've got to make compromises if you want to get some serious gaming done on the go. That said, Gigabyte has done some legwork to minimise the pain. Most critically, you get instant access to both integrated and discrete graphics, which on paper gives you the best of both worlds. It's not quite as simple as that. But it's a damn site better than having just one or the other. 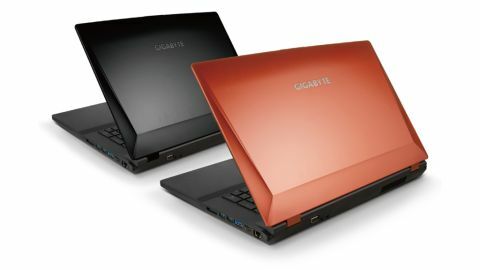 As for which laptops make up this Gigabyte's competition, it depends on what exactly you're after. There are traditional monsters like the PC Specialist Vortex III 680, which cost well over £1,200 but packs even more powerful graphics. Then there's the intriguing MSI GX60 and its AMD APU combined with Radeon HD 7970M graphics. It's pretty close on price but shifts the balance decisively away from the CPU and towards graphics in terms of where the money's been spent. Just to shake things up, another option is the burgeoning market for gaming orientated Ultrabooks. Indeed, Gigabyte itself is in on that game with the U2442F. It's not as powerful as its bigger brother. But it's miles more portable.